BOSTON, April 30, 2007 – Technomad Associates, LLC announces that Fort Hood Army Base in Texas recently purchased six of its Turnkey Military PA systems, bringing the bases inventory of these high-powered weatherproof systems to 19. 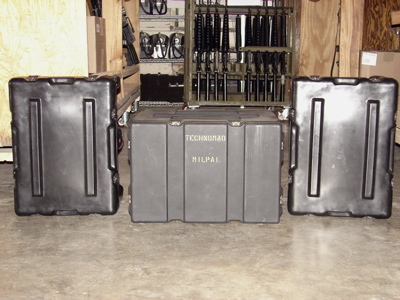 The Turnkey systems, which include Technomad weatherproof loudspeakers, a pre-wired amplifier and a signal processing rack complete with microphones, CD/tape players, speaker stands and cables, are made available to soldiers for ceremonies, training, and command briefings among other military audio applications. The flexibility of both outdoor and indoor PA system applications for military bases has allowed Fort Hood to standardize on Technomad in recent years for military audio applications. Fort Hood is a 190,000-plus acre military post used to house and train the divisions that fall under the Third Armored Corps of the U.S. Army. As one of the largest armored U.S. military posts in the world, the base offers an enormous amount of open training space. It is considered an excellent military base for training for war situations due to its geographical location and the layout of its terrain. Josh Cavness, AV Support Lead at the Fort Hood Training Support Center, cites durability and quick setup as major benefits of the Technomad design. The all-in-one design of the Technomad system is a big plus for military applications at Fort Hood. Soldiers can sign out a system for field use and transport only two speaker boxes and one separate box with all the instrumentation, instead of the 10-12 separate pieces standard with other systems, said Cavness. The compact design of the system means that the speakers can be set up virtually anywhere on the base, and simple connections from the power supply to the rack means setup is quick and painless. And the systems remain highly durable even as they are repeatedly tested with dirt and abuse in the field. Technomad Military PA systems offer CD-quality digital audio and speech intelligibility far superior to traditional horn speaker systems that suffer from inherent distortion and narrow audio bandwidth. According to Cavness, Fort Hood soldiers often drive tanks and other heavy artillery vehicles out to the middle of nowhere for battle training. In these situations, the speakers are often pushed to the highest possible volume levels to attain the power and distance needed to communicate with soldiers. He added that this further confirms the durability of the speakers in the field, especially since they rarely require maintenance. The Technomad speakers provide excellent sound dispersement and audio quality for speech and music, he said. The Army schedules a large number of ceremonies and they demand professionalism throughout. We have never received a complaint with these speakers in terms of audio quality, from both the speakers and microphone use. We have similarly received only positive feedback in training applications. The commander’s voice needs to be clear and audible in these situations, such as tank firing certifications. The soldiers can clearly understand the commands to fire with the Technomad system that they might not otherwise hear clearly or at all with a less reliable system or a naked voice in the field. Weatherproof construction was cited as an important benefit. The Army doesn’t stop for inclement weather, said Cavness. The Technomad loudspeakers offer a weatherproof design that allow for continued use in harsh weather conditions from rain and wind to sleet and snow, without any compromise in sound quality. Though mainly used outdoors, Technomad Military PA systems are true Swiss army knives in that the same system used for combat simulation and outdoor command ceremonies can serve as a reliable indoor speaker system for smaller ceremonies and presentations where premium audio quality is required. Technomad loudspeakers are highly intelligible in large, reverberant spaces such as gymnasiums and hangars. Technomad Military PA systems arrive to all military customers pre-wired and ready to use, with a typical setup time of 15 minutes or less. The Fort Hood systems also include the optional wireless microphones, which provide more freedom in training and command applications. Technomad Military PA systems are used at military bases around the globe for a variety of training applications and military ceremonies, as well as mass notification and forward operating base PA systems. As an all-in-one solution, it is no longer necessary to carry a mix of PA systems for different events; Technomad Turnkey and Modular PA systems can provide rugged, reliable, high-audio quality installations for any military audio application. Setup can be accomplished by a single operator regardless of audio expertise. All systems are built into rugged flight-cases and are fully weatherproof. Protective gasketed lids clamp onto the front of the loudspeakers and the control rack, converting the system into flight-cases ready for convenient transport. System options include wireless microphones, telephone system interfaces, solar and wind power, DC power or ‘euro’ AC power adapters, and the new SuperConductor military MP3 player. Technomad Associates, LLC, founded in 1995, designs and manufactures loudspeaker systems for the professional audio and security / military technology / mass notification industries. The company invented the first reliable full-range military PA systems and now offers eight models with range up to one mile, as well as the SuperConductor military MP3 player and Firefly ultra-lightweight PA system. These products are widely used for Giant Voice / Big Voice, PSYOPS, MOUT, Mass Notification, and Force Protection applications.